As the black rains pelt down everywhere, and everyone is running for their life, a young man tried to grab a hold of Harper, but winds up falling down. If it were not for Bellamy and Kane, then Louis would have been left out there. Harper feels considerably guilty about not helping him, and allows herself to crack a little to express grief. Grief is not often shown on The 100, so it was a little bit of a shock, if not refreshing to see it. Harper makes Louis’s last moments comfortable as she sits by his side. Watching the passing of a love one or friend is certainly sad, and we may not get over it, but being there for them is the best we can do. The chemistry and affair between Octavia and Ilian was predictable and set up from the start. She virtually hated his guts after he burned down Arkadia, but for some odd reason, Ilian decided to follow her. He shares his sad story, and Octavia tells him that he is not a killer. Since Lincoln’s death, Octavia has turned off any emotion, and killing senselessly. It is understandable of going numb, but she desires so much just to feel something. So, the two of them go after their passion in a cave from the black rains. Afterwards, Octavia is seen throwing her blades into the water; maybe as symbolism that she is giving up the “Skairipa” lifestyle? I hope so, as I do not favor mindless murders, but it appears that Ilian lifted a barrier off Octavia. It may be too soon to judge that. Emori always had a natch for survival, doing whatever it took to live another day. It was no different for her in Gimme Shelter. Deeply concerned that Emori would be a ‘guinea pig’ for the bone marrow trial, she lies about Baylis being the man who ruined her life, and Clarke and Abby use him for the test. It does beg the question of humanity vs. science, but as long it is not Emori, she does not care who it may in her place. 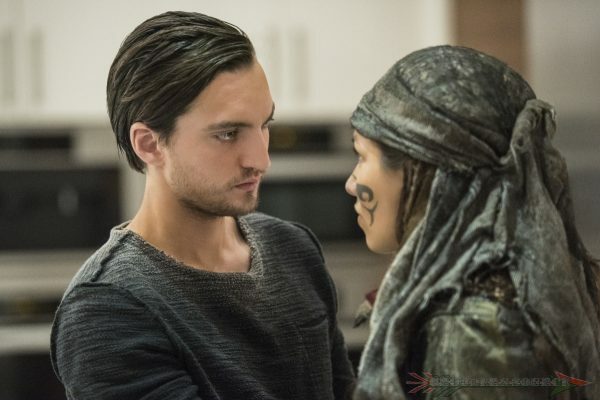 Murphy figured quickly about his love’s scheme, and is impressed. The two of them are mirrored, and that makes the Memori relationship much more interesting. I don’t know if I blame Emori for her choice, but I am not in that predicament. We now have a test subject for the bone marrow experiment, and it is Baylis. Abby questions if sacrificing a human life for the sake of survival makes her a murderer. That is a pretty deep perspective. But, in order to find out if the bone marrow would work, they have to make that choice. Keep in mind, that nobody wants to do this, but it is for the sake of the human race. So, we will see if the test is a success or not. That rounds up this edition of The Top 5 OMG’s! Later this week, The Top 5 OMG’s for God Complex (and review) will be up. You will be amazed at what I have chosen!